Blurb: GDQ returns with an amazing sophomore effort that proves they are more than a supergroup in name only. 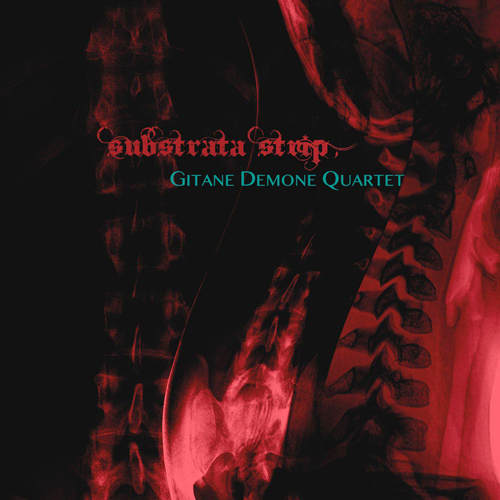 Gitane Demone Quartet hasn’t wasted much time between the debut album, Past the Sun, and the follow-up album, Substrata Strip, but the band has grown as a unit by leaps and bounds. The music here feels much warmer and more purposeful. Just listen to the lead track, “Douglas Street,” with its emotive lyrics seeming more like a news report than a stock ‘song’ – it builds and builds from the effects of the helicopter overtop of Paul Roessler’s keyboard trumpet sounds that herald the coming announcement by Demone, “There is a death on Douglas Street, down at the bottom of the hill.” Rikk Agnew and Deb Venom’s guitar and bass buzz behind her voice, the tension building so slowly as she continues to unfold the scene. The lyrics end with one final, bone chilling howl of, “How do you rest in peace?” and the music is so tense, you could slice it with your finger. One would expect the song to erupt into a loud cacophony of anger and grit, but instead, it slides into a very silky, jazzy end with Agnew’s guitar sounding siren like, giving a very peaceful resolution to what you would think should be a very grinding outro. And this is only the first track! “Amarathene” is as fine a song as you will likely hear, a track that demands attention as its gorgeous melody sways the listener into Demone’s elegant delivery of a song so full of passion. The instrumentation is so delicate and understated until close to the end of the track when Agnew’s guitar breaks through like barbed wire to add a little blood to the wine. This is absolutely, in this writer’s opinion, a contender for song of the year and it would make an impressive single for the band. Clocking in at almost 13 minutes is a cover of Sun Ra’s “Retrospekt,” which takes full advantage of everyone’s talent within this ensemble as they interplay seamlessly. The band has a chance to shine in this freeform realm – no acid required to enjoy this trip. “Prayer for Peace” wraps everything up with as much tension as the album opener, but instead of senseless tragic circumstance, it is a palpable pleading for love. The music is pounded out in a very tribal rhythm to let Demone’s angelic benediction ring loud and clear for all to bear witness and feel. Substrata Strip strikes hard down to the bone as its intensity fills every single second. 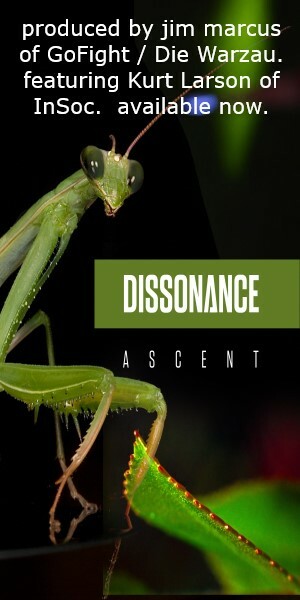 There is no filler at all here; each track is replete with such unbelievable musicality that you will not help but have a physical reaction to some note or phrase. Time has not diminished Demone’s voice either as more than a few passages raised the hair on the back of my neck for either the sheer ferocity she is able to unleash or the honey drenched gentleness. Rikk Agnew is a revelation as well here; if you only know the harder edge goth/punk side of him, wait until your ears embrace the texture and color that he adds. One can tell that so much love went into making this record, and we can only hope there is much more to come.